In all my years helping businesses with marketing, there has been one common omission…. That has been the lack of PR – public relations. Understood. But that point of view lacks any kind of strategy. And if you want to build your brand into a stable sales and income line, you need a strategic plan and that plan should include public relations. Al Ries, is the co-author of Positioning the Battle for Your Mind, which is regarded by the readers of Advertising Age, the industry bible, as the greatest marketing book of all time. I have a client that is a veterinarian that has a 15-minute, Sunday morning TV show on a local television station. He has a multi-million-dollar practice. A client got an article placed in the top magazine for his industry. Stats screamed for months. My wife, the International President of the non-profit Lawrence Anthony Earth Organization (LAEO), organized a life-saving program to feed thousands of starving animals in Ukraine, including a safari park with 51 lions, when an economic crisis enveloped that nation and their zoo budgets disappeared. The lions feasted but so did the media; the Huffington Post and others covered the story: LAEO memberships and donations soared. As many of you know, I also write books and articles on the subject of global finance and investment. I also write a detective series that is great fun. But unless you are John Grisham or J.K. Rowlings, it’s hard to get media coverage for fiction authors. Non-fiction is a much easier sell to a producer. A while ago, I was talking to a friend who is a professional PR (Laurie Jessup, Laurie.jessup@verizon.net) and asked her if she could book me for any media interviews for my fiction books. She said she had a good contact at a local television station and she thought she could get me an on-air interview. She gave me a price. A few days later she called. Her contact was no longer at the local network station. The person was now a producer at Fox News headquarters in New York. And…. she could get me an interview on Fox & Friends, Fox’s nationally-broadcast, morning show. It had the highest ratings of any morning cable news show. But this would be for my non-fiction book on the global financial crisis, not the fiction book. She quoted me a price. I hadn’t budgeted for a national media appearance, but Fox national news. The thought process took about a second. She did. A few weeks later, I flew to New York and had a 3-minute interview on Fox & Friends. After the interview, as I headed back to my hotel in the network limo a cloud of uncertainty swept over me – how many books could I sell with a 3-minute television interview – even on national media. By the time I got to my hotel room – maybe 30 minutes after my segment – the book was an Amazon bestseller! More recently, I booked an interview on Coast to Coast AM with George Noory. For those of you not of the tribe “late-night”, the Coast to Coast radio show owns the night airwaves. The show, which runs from 10:00 PM to 2:00 AM Pacific (1:00 AM to 5:00 AM Eastern) has as many affiliates as Russ Limbaugh. It has a huge national and international audience. I did a two-hour segment with George on the global financial crisis and what to do about it. Sales of my newsletter, The Hard Truth, (www.thehardtruthmag.com) soared for two days. And a day after the interview my book, The Coming Financial Crisis, A Look Behind the Wizard’s Curtain, became a #1 Best Seller on Amazon in their Banking and Banks category. But, believe it or not, the purpose of this article is not to promote my non-fiction writing, though I am always delighted to have new readers and subscribers. 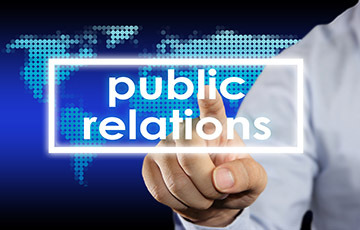 The purpose of the article is to enlighten readers on the importance and use of PR in business. I understand that not everybody is necessarily going to book an interview on Fox national news, do a Coast to Coast interview or save 10,000 starving animals in Ukrainian zoos. But if you are a local landscaping company, a cosmetic dentist, or a mortgage broker, you can get press. You need to have some kind of “hook” that makes your story unique, newsworthy and interesting. A mortgage broker could put together a pitch on how mortgage rates have spiked in the last several weeks and are likely to continue, despite the Federal Reserve statements to the contrary. The landscape architect can pitch a story about how to deal with one’s yard in the midst of a current drought. These are just off-the-top-of-the-head ideas that breeze through the mind as I write. Your pitch should be based on surveys of your public and the position that you develop from them. This is critical. Remember, the media loves controversy and positioning is often an “against” strategy. Not to wax political, but Trump’s victory was not based on “Make America Great Again” or even immigration or jobs. Yes, these were hot button issues, but at its core, and I’m not sure he fully understood the depth of this until the late stages of the campaign, his victory was a ground swell against the elite; against the entrenched establishment. The ideal scene is to have a marketing budget that embraces a professional PR firm – there are good ones that are reasonably priced. The firms that get results have their contacts in the media and in public relations, as in most things, relationships are the name of the game. If not an outside firm, then use someone on your staff who knows the rules of PR. But even you can read up on how to write a press release and get it distributed on PR Web or one of the professional online press distribution services. You’re not necessarily going to score an interview on Oprah with your first press release; you’ll need to repeat your message again and again, and drive your (surveyed) position into the mind of radio producers and reporters. It’s a PR world and you are in it. So, do your surveys (or have us do them), establish your position, and turn the PR machine loose.